If I could only have one cookbook, this would be it. Some of the most memorable meals I've had in my life have come from these recipes, which are complex, time intensive and require above average skill in the kitchen. There are so many separate elements that must be prepared, but they come together in a glorious fusion of flavor that is unforgettable. If you are a passionate home cook like me, and don't mind spending the entire day (or days) preparing a special meal, this cookbook is a must. I highly recommend the Sweet Potato Agnolotti, Butter Poached Lobster, Five-Spiced Lobster, Chaource with Red Plums and Ile Flottante. This book has truly modified how i see the act of cooking and made me realize how truly wonderful the quest for excellence can be. Yes, the steps and the work can be daunting for most of the recipes but each and every one of the recipes tried, when followed almost to the letter, have been outstanding. Incredibly beautiful book. The recipes all sound delicious, but some a bit daunting for the home cook. I'd love to eat at The French Laundry someday, but while I save my money and dream, I can look at the beautiful pictures and read the recipes. I worked as a cook for Thomas years ago and his perfectionism is as thorough in real life as it is in this book. Simply amazing. Keller's comment is spot on: this is RICH and a small portion goes a long way. I cut down on the tarragon and added some chunks of lobster before serving. These are absolutely delicious and impressive (low effort for return). I've made these twice, once with gruyere, the other time with a good cheddar. Even better - these can be made ahead of time if you need to give yourself extra time on the day of an event. Pipe the dough onto a lined tray and sprinkle with cheese, then freeze. Bake straight from the freezer, allowing another 5 minutes or so to bake through. 2 out of 5 stars and I wouldn’t do this recipe again. Maybe it was the quality of the goat cheese (Costco)? Maybe trying three different cheeses to test them out threw it all off? (Parmesan, Comte, and Manchego). Maybe it is I have out-of-this-world expectations with this cookbook? My only recommendation is not to do this recipe as a canape for a dinner party when your friends are coming over. One take away is that I have never done a cheese crisp before and making all three, really showed the diversity of cheese and how they can alter a dish. So cheers on that. If I was served this at his restaurant, I’d be bummed. Simple and elegant. I used chives in place of the parsley. Definitely worth a repeat. I used Asian micro greens in place of the frisée. My first batch of tomato confit burned (but was still tasty), so I made a second batch and used about 2/3 of the second batch and 1/3 of the first batch for the tomato confit. Good but an awful lot of work. I probably wouldn’t make it again. I used canned tomatoes. It still came out good, but you have to watch the tomatoes in the oven to ensure they don’t burn. Pretty decent. The tongue was super tender. Doable for home cooks and very tasty. I used wild haddock for the my fish. I like the idea of using the steamer to blanch the veg. It worked really well. 2 Stars and very underwhelmed on this recipe. I wouldn’t have sent it back, but I would have been so diassapointed if this was what I had at French Laundry. I would have voiced my opionon to the waiter though. The bordelaise sauce is marginal. The Chanterelles are lackluster but true to taste. The pommes Anna is nice with the twist of prunes, but a bit too buttery. The top layer of the potato does stick when you invert it. He does insightfully give a foreshadowing disclaimer early on the recipe regarding the sticking. It’s best just to serve it out of the pan on the table without the flip I think. The steak alone, OK. Watch the cooking time, if you go by his, your steak may be well done. All of the components together...a bummer. I would like to do the pommes Anna again with the prune twist though - that gets a four stars with a note of using less butter. For the “quick” venison sauce I reduced 6 c. chicken stock and 1 c. Cranberries down to 3/4 c. It worked fine. Compared to some of the other recipes in this cookbook, it was comparatively quick and easy. It was pretty good, but I’m not sure if I’d make it again. Not bad for liver and onions, but it sure uses a lot of pots! Easy, though I’m not sure it’s worth the effort. Fairly easy. Really good! Definitely worth a repeat! ...the truffles were like the best Reese’s peanut butter cups ever made. Thomas Keller's doughnuts are absolutely wonderful. Probably the best homemade doughnuts I've ever had. They were gone in seconds. Thomas Keller, chef/proprietor of the French Laundry - the most exciting place to eat in the United States, writes Ruth Reichl in the New York Times - is a wizard, a purist, a man obsessed with getting it right. His flavors have clarity and intensity. His methods dazzle. Every mouthful is an explosion of taste. This cookbook, Keller's first, is as satisfying as a French Laundry meal, a series of small, highly refined, intensely focused courses. 150 recipes an more than 200 photographs Keller's wit and whimsy find expression in unique recipes (and titles) such as lobster-filled crepes with a carrot emulsion sauce, topped with a pea shoot salad dressed lightly with lemon-infused oil (Peas and Carrots), or sauteed monkfish tail with braised ox tails, salsify, and crepes (Surf and Turf). This is a book to cook from, to learn from, to savor. 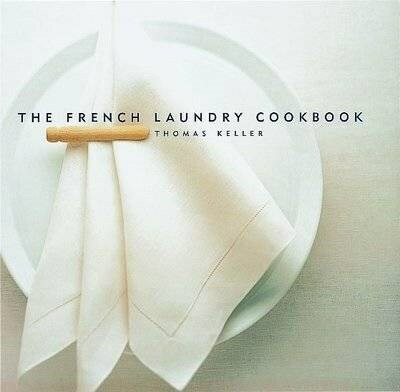 Thomas Keller is chef and owner of the French Laundry and the more casual Bouchon in Yountville, California. He was the chef of La Reserve, Raphael, and Rakel in New York before moving to California.